Is net neutrality going to be a major effect on the web? Net neutrality gives us the freedom of speech online and it makes us as the people online to have the right to post and that the online world can not discriminate or judge us on anything so that we can or may put out there. But without net neutrality it won’t be able to protect our free of speech. And this gives the companies like the cell phone companies to block some of our favorite apps that we use and they will make us buy them off of them. Without net neutrality this gives them more freedom to do stuff with our phones. Companies like Sprint or T-Mobile will be able to block some options that they may not like without the approval of us the consumers. They will be able to decide what websites we can use and which ones we will not be able to. 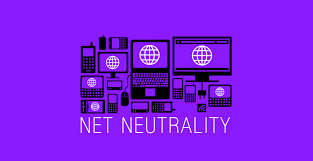 Net neutrality is the main thing of a service provider like the companies that i have stated above and that they must not discriminate or charge everybody differently by user platform of method of communication. Many people don’t want net neutrality to be taken away because then that would mean that the online media would be totally different. I personally don’t want net neutrality to be gone. Because then that would mean that we would have to pay for things that used to be free. Like websites or apps that we use on the daily like Instagram, Twitter, YouTube and Snapchat, these are apps that people use on the daily and if you have to pay in order to have them again that’s gonna ruin the whole purpose of social media. In my opinion, I hope that this will get resolved in the near future and that this won’t ruin the future of social media and the internet platform.